preferences.xml Example of adding a config to your preferences. seek_bar_preference.xml The XML layout of the preference. This should go in your res/layout directory. The preference layout file. You can use this to tweek what the preference looks like. Great work ! Very nice and useful. However I noticed that calling ‘notifyChanged();’ in ‘onProgressChanged’ prevents the proper tracking of the thumb. I suggest to update mStatusText only in ‘onProgressChanged’, and to actually change the preference value in ‘onStopTrackingTouch’. This will fix the tracking problem, and also will be a bit more efficient. Thanks for the suggestion! I’ve updated the code. FYI, setting a min value doesn’t seem to work. I have a value I want to go from 32 to 255 and the slider position moves incorrectly/erratically. You’re right, there was a bug in the java code. The code that set the initial progress bar position was wrong, so the first time you moved it you’d get a seemingly random new value. I didn’t notice it because my min value was 1. I’ve updated the code. Thanks for the bug report, I hope the code is useful for you! Kirk, glad you got it fixed. And yes, it’s very useful! There are bug in this control when number of seekbars is more than one on single preference activity screen. Can your fix it? It’s fixed now. I wasn’t handling the onBindView call correctly, so the views were getting switched around. I’ve tried to follow the method used by the built-in EditTextPreference, so hopefully it will behave itself. I made a couple of other small tweaks to make it work in a more “standard” fashion. Thank you very much. it’s very useful. However, I don’t know what should I do tracking of the thumb using dpad(left-right). Could you inform to me? I assumed you could just listen for them on the preference, but something seems to be grabbing keystrokes before they get there. I’ll post an update if I figure out how to do it. I’m also trying to control the progress bar with dpad (left-right). I already changed SeekBarPreference.java to add an OnKeyListener but onKey callback is not called! Great! thank you very much. it’s good. I am not sure if it works, cause if I use sharedpreferance with the same key in another place in my application it does not give value set within PreferanceActivity. Also if I set value outside PreferanceActivity with shared rpeference editor it doesn’t change value within SeekBarPreference. Hmm, I’m not sure why that would be. I’m fetching the value in my app without any problems, but I’m not setting it outside the PreferenceActivity. Let me know if you find the issue. Thanks a lot for sharing you class! Thanks for the info! I haven’t seen that happen, but it probably depends on what your listener is doing. I’ve swapped the order as you suggested, since it should be safer. I’m using this in a preference activity, and in the androidmanifest.xml I declare a theme for the preference activity . This causes the seek bar to not display. Anyone else encounter this? Also, another issue is the text and summary are not matching the default device theme colors, would be nice to have. – Sorry that got culled out I guess, had to remove the opening less-than sign. Hi, this is a little old but have you find a way to solve that problem ? I have the same and i don’t know how to do. I have some kind problems with the seek bar, when touch on thumb to change value it disappears, when I release my finger it appears…. Also seek bar is “GONE”, when I have more then one element in preference category.. I found it while trying to get rid of my Lint Warnings for “unused” custom attributes. Any ideas how this namespace tying Java code and XML stuff together really works? I find this code doesn’t work well in diffirent version of Android. If works well in 2.3 and 4.0, But for 2.2.2 and 3.0 it doesn’t work well. How to solve this? The padding is not same as CheckBoxPreference and other exists Preference. I think the style maybe not right. But I can’t find how to solve this. 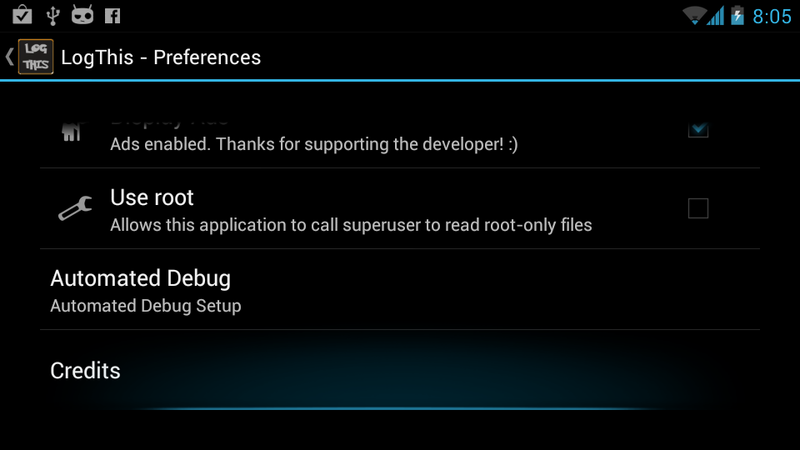 How to coop with an ‘android:dependancy’? The title stays white, althought the rest of the custom vies turns grey. There are definitely problems with theming. I don’t know enough about Android UI theming to tell what’s going wrong, and I don’t have an actual Android device to test with (I just developed on the emulator). I’ve seen it behave differently on different devices depending on the phone vendor’s modifications. If anyone can offer any tips, I’d appreciate it. Very good job on your Android tweak. What I would like to point out to Android experts is that, some of us are not familiar with Android. So, very clear “how to insert code” tutorials would be good. If you have the time, ofc. However, the code worked beautifully for me. Even thou I do not understand everything in it! nice tutorials, do you tell me how to build android application game tank step by step please, now i’m last semester in my study.please help me. I’m trying to use your seek bar preference component on a very simple preference list app. The seek bar appears in a separate dialog Box and the value is never taken into account in the shared preference file… What am i doing wrong ?? It seems impossible to debug the component either, i put a breakpoint in every single method and execution never stops (i’m using an emulator). Really a very good work, very valuable, improved a lot avoid to using the arrays. Thanks so much for doing this but I am having some issue getting the SeekBar to show up. I can see the title, summary and value text but no seekbar. Is there something obvious I might be missing? I’m not sure what would cause that. Are you getting any errors in your log? The seek bar gets added to the view on line 106 of SeekBarPreference.java. The first thing I’d try is setting a breakpoint there and stepping through to see if something is going wrong. Yeah it’s definitely hitting it, and no, no errors. I tried adding it to a framelayout instead, but nothing. HierarchyViewer is not showing any views below the LinearLayout container (nor the Framelayout when I tried that). Have you tried this with a PreferenceFragment? I’m just trying to figure out what I might be missing. Oh it works with a PreferenceActivity…that’s weird. Great work…Thanks a lot for sharing.:). Is the attached code contains all the bugfixes and improvements made by you. If not, where can I find the latest code. Other than the 3 files, is there some additional project modifications necessary? I’d prefer not to have to name the project robobunny! Any suggestions would be appreciated, as I’d love to make this work. There’s another name that needs to match between the code and the XML: the xmlns. I think that might be the problem you’re seeing. (Obviously you can rename ROBOBUNNYNS if you do so throughout the code). Also, if you rename xmlns:robobunny to something else, you’ll need to also rename all the robobunny: strings in the XML. I think that’s probably what is wrong in your case from the error you’re getting. Let me know if that doesn’t fix your problem. When using the android:dependency field the only thing that gets greyed out is the summary. The Seekbar is also still useable. Thanks for the modifications they work perfectly. to summary. I had to include + sign before id or otherwise it just gave Error: No resource found that matches the given name. I have Android 2.3.6. Thanks for this post, I had the same problem. Seems to occur if the summary is a bit longer than expected. The Error that you are talking about is explained here just for future reference. I do have a slight problem with this method though. For some reason, once I made this change, the unitsRight text is now on the left of the value :?. Anybody know why this could be the case? I cannot explain this, but this is what I add to do completely to the layout file to fix the problem that I was having. You didn’t have a license on your work. Is it alright to use this in a commercial android application? Yes, you can consider it public domain. If you find any bugs or make any improvements, I’d appreciate it if you post them here. With your permission, Google should include this in the next Android release, as it’s very useful indeed. I’m using your great seekbar in one of my apps. Instead of creating the layout from XML for the preferences page I’m creating the page dynamically in code as it’s quite variable. What’s the best way I can use it in combination with dynamic screen creation? I apologize that I can’t help you much, I don’t have very much experience with android GUI stuff myself. I created this widget for a program I was working on, but I haven’t used the built in android UI stuff subsequently. Hopefully someone else can answer your question. BTW, the guy posting in the thread you referenced was not me, his post was just worded slightly confusingly. He seems to have a widget based on mine, he may be able to assist you. Great piece of code, helped me a lot! I want to ask one thing, though. How would I dynamically set the minimum value of a seekbar to be equal to the current value of another seekbar? Think Max speed / Min speed values, the min value should not be able to go above the max one. You’d have to add a couple new parameters to SeekBarPreference.java that can be updated externally, then check those new values in onProgressChanged to see if the user tried to make the setting lower or higher than is allowed. You can just return without setting anything (like the code in the middle of onProgressChanged). You’d also have to update the setting on the bar when something changes the min or max value. Then of course you’d have to have the two seekbars send updates back and forth. It gets very tricky when you’re trying to link two bar settings together like that, especially for the user. The ideal solution would be to have two handles on one bar, so it’s obvious to the user what is going on when the handles won’t cross each other. You can also have one handle slide the other when they bump, or hit a minimum distance from each other. Many years ago I used something like that in a game for a bar used to allocate energy, and it worked out ok. That might actually be easier to do than making two seek bars talk to each other, too. Dude ur the best! This is exactly where I got stuck. Thanks for sharing your code. This is a big help for me. I added another ‘android:layout_toLeftOf=”@+id/seekBarPrefUnitsLeft”‘ to the summary-block in seek_bar_preference.xml. This way long summaries don’t overlap the prefUnit-stuff. I’ve used your preference and it’s excellent. However, I had one problem with it – it doesn’t use the theme, so it looks completely different than the other preferences on my activity. So – I’ve changed it abit, basically so it will use the default Preference’s layout, and your layout deals only with the widgetFrame in it. If you would like – I can send you the changes I’ve done. My implementation is based on the CheckButtonPreference and is reusing the base Android stuff, i just extend Androids default layout, so it should look like the Version of Android you are using. And it’s a Library Project btw. Feel free to check it out, the source is available on github. I am working on a TEXT TO SPEECH (TTS) app development which read a text file, with varying voice speed and voice pitch. Also currently I am reading from a string, instead of this I want to read from a text file. in place of the existing setText at the two proper locations. upper and lower limits need to be multiplied by the divisor. But I am having a problem :(. The SeekBarPreference is only displaying the seek bar and the title. I don’t see a summary or actual value or “unitsRight” either. Does anyone know what the problem could be? I have copied the code and everything exactly, and it’s not working :/. I am running this on min API 14, if that maybe has something to do with the problem. I did not realise that this was white :O, once removed, I could see everything :). (I needed this for my specific case). Now, the issue that I encountered. I have the seekbar set with min=0, max=91, interval=7 (to select from 0 to 13 weeks in 1 week interval – but get results in days). When I touch and slide, the seekbar adjusts once to the next step value (up or down) and then stops. I have to remove my finger, then touch again and slide again to continue adjustment. I don’t think this is the right behaviour though. What am I missing here? Ok, on further investigation the issue seems to be caused by updates to ANY preference in the onPreferenceChangeListener of the SeekBarPreference. In my case, when the seekbar position changes, in my listener I am updating summary and enable/disable status of another preference just below this one. If I comment out this update code, then everything works as expected. Any ideas as to how to fix it? I don’t know what you changed, but I think this might be worth looking at. How can I create a new object of type SeekBarPreference and your constructors? I do not know what values should I give to context and attributes.